I purchased this from Denise here. Be sure to visit her blog Uniquely Tea. hahaha, great sticker! I see my teapot in your picture of teapots to the right of this post...Lady Carlyle. I could not get an email to go through to you so I will leave you a message here. Thank you so much for visiting my blog 'Our Journey Through Alzheimers'. I really admire you for all your caregiving skills and your loving nature. Yes, we caregivers need to lean on and learn from each other. I have to tell you a little story. My daughter (who wouldn't blog if she was given a zillion dollars to) had to find a recipe for tea and she goggled in some description for tea. The next day she was telling me 'I found this page with a tea recipe and there was a purple Alzheimer's bracelet on it and the site played music' and I just started laughing. 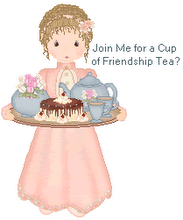 'That's my Friendship Tea friend's blog'. I thought it so funny. I like your bumper sticker. Will be on the look out for you. Thanks for the "endorsement" Linda! Tony and I just returned from a weeklong cruise to the Bahamas and Florida. I'm catching up on my favorite blogs tonight...hope all is well!